'Inaugural Ball' (Joseph Ghio, R. 1987). Seedling# 82-124-J3. TB, 40" (102 cm), Early midseason to late bloom. Metallic red purple; blue beard. 'Titan's Glory' X 'Bubbling Over'. Bay View Gardens 1988. Honorable Mention 1990. From Bay View Gardens catalog,1988: INAUGURAL BALL, 40 inches, EML. $35.00. Nearly 200 seedlings were bloomed from this cross with several selected for further observation. Inaugural Ball is the final selection from this extraordinary cross. 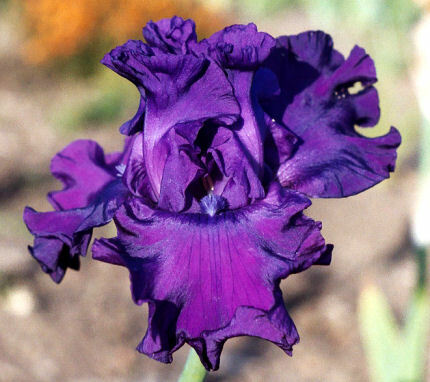 Tall, sturdy stalks, show branching, multi-budded and great vigor are the hallmarks of this metallic red-purple with blue beards that shine out like beacons in the night. Full "Ghio-form" with the deep bubble-ruffling you'd expect of an iris of this heritage. No. 82-124-J3: Titan's Glory X Bubbling Over. JPG InauguralBallSI.JPG manage 244 K 16 Apr 2019 - 21:53 Main.TLaurin Photo by Sandy Ives.